Of course, you will not only get shoes in our well-stocked online shoe shop, but also suitable care products and practical accessories. 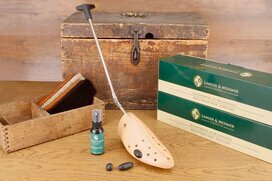 These include shoe stretchers, which we offer exclusively made from beechwood. They make a valuable contribution when it comes to significantly extending the life of your shoes. Shoe stretchers are not to be confused with shoe trees. The latter are there to retain the shoes original shape and fit, whereas a shoe stretcher can be selectively employed to widen your shoe when it causes uncomfortable pressure points on your feet. How do shoe stretchers work? The shoe stretchers, which you can buy in our shop, are made out of highly varnished beechwood and the mechanical parts are constructed in sturdy stainless steel. The beechwood toe block is adorned on both the left and right side with numerous plug holes. In these, plastic spot-stretching plugs in different sizes are attached to stretch the shoe in the appropriate place and to the desired extent. For this, the handle at the end of the device must be turned counterclockwise, which causes the two halves of the toe block to spread. Be careful not to overstretch the leather! The use of multiple plugs is also possible, allowing you to make several pressure points. All our shoe stretchers are coated with a protective layer of varnish and equipped with a sturdy metal mechanism. In addition, they can be used for both the right and the left side of the shoe. In addition to your order you will receive a practical leather stretch spray at no extra charge. Spray on the appropriate desired places on your shoes, so that the leather is particularly soft and can be stretched even better. Take a look at the many other products that are waiting for you in our shop! 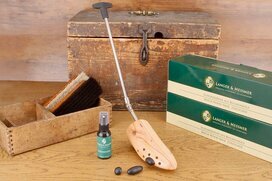 At Langer & Messmer you get high-quality shoes - for example from the traditional English manufacturer LOAKE - as well as numerous shoe care products, starting with the simple horsehair brush up to a complete shoe care set.